On June 20, 2016 at 6:34 P.M. E.S.T., our sun achieves the most northern point in its journey and stops. The summer solstice marks the moment when the sun stands still; a Latin derivative from the words sol, meaning ”sun”, and sistere, meaning “to come to a stop.” Imagine the wonder and curiosity associated with such a phenomenon in the ancient world! For many observing solar movement, time literally stood still. Ancient Chinese celebrated the yin, or femininity, on the June solstice. Ancient Egyptians believed the solstice signaled the coming of the annual flooding of the Nile River, which nourished their fields. Modern celebrations continue across the globe. This year, my soon-to-be chemistry students are celebrating on Schoology as they complete their summer assignments. You’re welcome, kiddos! 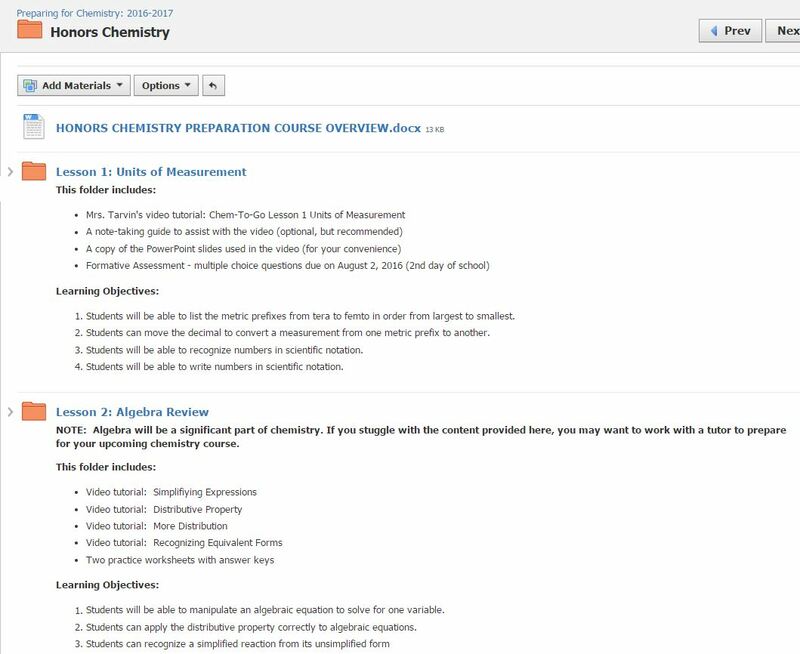 Last month, I explained my chemistry team’s plan to implement our first pre-course assignments for next year’s students. Thank you for your feedback! Our team read each of your comments, and we discussed your experiences and questions. We developed the courses in Schoology basically as described in my May blog post. You can view the students' checklist attached to this article. The students see the following four courses when they log in, and they find four to six assignment folders inside the appropriate course. 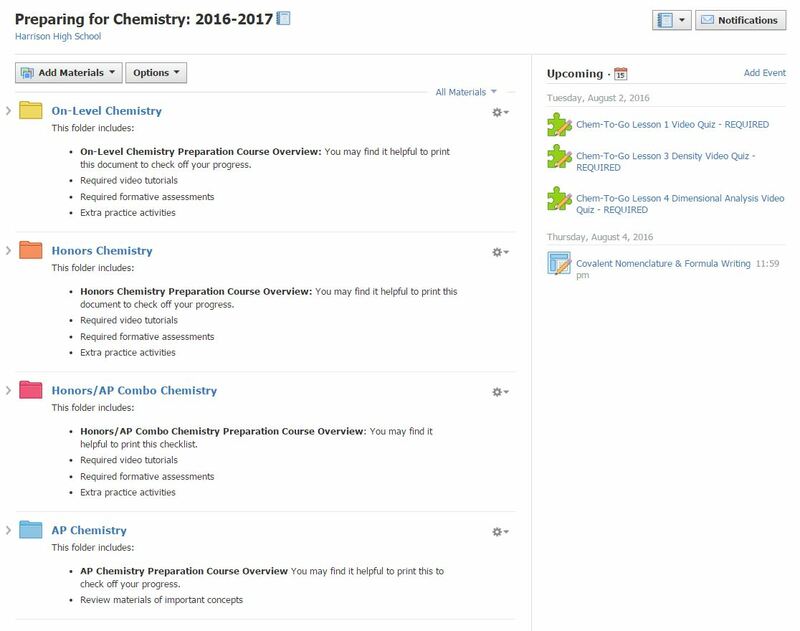 41 students have joined the Preparing for Chemistry 2016-2017 course on Schoology. 21 students have spent 20 minutes or more working in the course during the first two weeks of summer. Two students have completed the Metric System Review assignment and online quiz. The average score is 80%. No on-level students have completed the next assignment. Four students have completed the Metric System Review assignment and online quiz. The average score is 85%. Two students have completed the Density Review assignment and online quiz. The average score is 100%. Two students have completed the Dimensional Analysis assignment and online quiz. The average score is 88%. Seven students have completed the Metric System Review assignment and online quiz. The average score is 91%. Three students have completed the Density Review assignment and online quiz. The average score is 87%. Three students have completed the Dimensional Analysis assignment and online quiz. The average score is 100%. Students have most commonly spent between 25 and 90 minutes working in the course thus far. Seven students have invested more than one hour of time. Many students are accessing the "extra help" links, particularly simplifying expressions in algebra. The number of students currently enrolled is extremely low. The number should be five or six times higher. One of the honors chemistry students ran out of time answering a dimensional analysis question in the online quiz. Will the three-minute time limit need to be increased? Two of the hyper-accelerated, honors/AP combination chemistry students made simple algebra mistakes when solving for mass and/or volume in the density online quiz. Will this be a theme? How and when should I respond? Algebra is often an unexpected weakness in our hyper-accelerated math students. Schoology allows teachers to distribute "badges" to encourage and recognize student performance. I created and distributed a badge to each of the students who has spent over an hour in the course. I'm proud of their motivation. What can I do to encourage more? I'm only interested in positive reinforcement. I'm deeply interested in your wisdom and advice! Please leave a comment or idea. I'm also happy to share more details of our assignments if you have been encouraged to develop something for your students. Happy Summer!